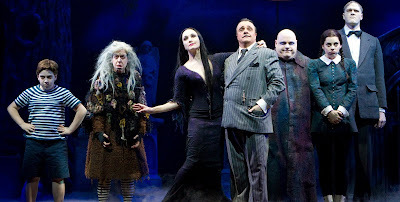 By Grace Lisandrelli The delightfully dismal The Addams Family has returned as a musical. Gomez and Morticia’s daughter, Wednesday, has fallen in love with Lucas Bieneke, an all-American boy from Ohio. Wednesday forsakes her affiliation with all things grim and gruesome in favor of a positive approach to life, much to her family’s dismay. When Lucas’ parents arrive for dinner, Wednesday begs her family to act “nor­mal” for just one night. Lucas asks the same of his parents, two rather conservative Midwesterners. Hilarity ensues when these polar­ized families spend the evening together, posing an interesting question: what, exactly, is “normal”? The Addams Family is irresistibly funny, full of clever one-liners that had the audience laughing out loud. The script did have an overabundance of modern political jokes, though, which fell flat and affected the show’s equilibrium. The strong bond among the members of The Addams Family is clear. The cast interacted naturally with one another, which made them appear very much like a real family. The Addams Family is a fun relic for fans of this “creepy, kooky, spooky” but loveable family. TICKETS: $41.50 student rush • Lunt-Fontanne Theatre, 205 W. 46th St.